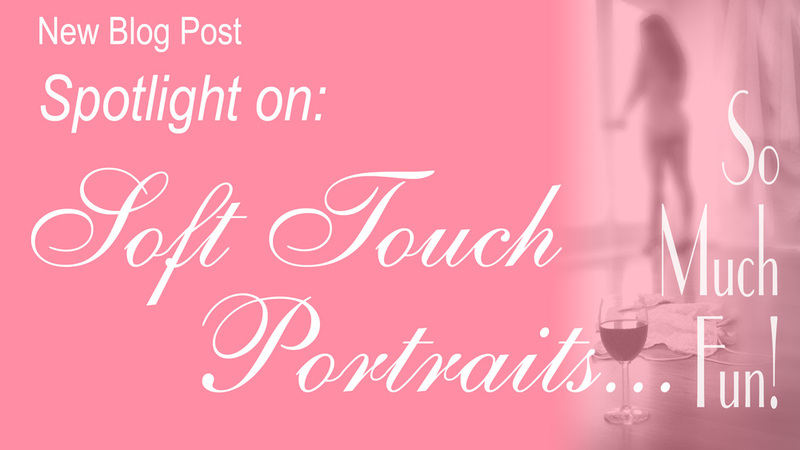 On Valentine’s Day, we spotlight our most romantic product line — Soft Touch Boudoir Portraits. When we began creating elegant romantic portraits of women, Glamour Shots® were huge and their studios were everywhere. We did our share of “shots” with lots of make-up and lots of big hair… but we were never really fond of that look. Our style was softer and prettier, much more boudoir than glamour, but “Boudoir” was a new term and we could never remember how to spell it, so we called them “Soft Touch”. Your Soft Touch Session does include our wonderful stylist, who helps you with hair and make-up, but it’s not a “makeover” session… we don’t want you to look like someone else. In many years of doing boudoir sessions, we’ve had the pleasure to work with all kinds, and ages, and sizes of clients. Clients in their twenties are often creating a wonderful Groom Gift for an upcoming wedding. (Some of our wedding packages include a Soft Touch Groom Gift Session, but we also photograph a number of brides who are not booked with us for their wedding.) Either way, there is simply no better Groom Gift than an intimate album of you! Of course, if you’re having lots of fun at your session, you are going to look great! Everyone who experiences a Soft Touch Portrait Sessions leaves talking about how much FUN she had. There is just something uplifting and energizing about being pampered and feeling beautiful for a few hours. The gorgeous pictures that come later are just an added bonus! Another big occasion for scheduling a session seems to be milestone birthdays… so much so, that we have created special “Fabulous Forty” and “Fantastic Fifty” packages for women who want to celebrate just how fabulous they are at this point in their lives… We always point out that a little digital magic can take care of a line here, or an extra pound there, but there is no way to digitally enhance the grace and beauty that comes with experience. Because of the intimate style of portraits most clients choose, we do not share many sample images here on our website. The only way to see examples of Soft Touch images is to make an appointment for a Consultation and come view them in person. We hope that you will do just that — please call the studio T-F, 10-5 or use the contact form anytime, to schedule your own consultation. While we’re on the topic of Soft Touch samples and our website… we would love to have at least a few more sample images to show. If you would be interested in a FREE session as well as a special package in exchange for allowing us to use some of your more “tame” images as online samples, please contact us. With that in mind, the best applicant should be 35 – 50 and not look like a fashion model, but rather, like a “real” person. Please give us a call if that person is you! Click a TAG or a CATEGORY below to see past blog posts about many different topics.